I am sure all of us have been in the situation where we could not delete a layer. For some reason AutoCAD will not remove the layer when running the purge command. This is where we take a look at the layer delete command. The LAYDEL command has been part of the express tools since AutoCAD 2010. Type LAYDEL at the command prompt. Remember to always look at the command line. Since AutoCAD 2013 there have been some significant improvements to the command line. Select Name as shown above or type N and hit Enter. AutoCAD will bring up a list of layers to chose from. 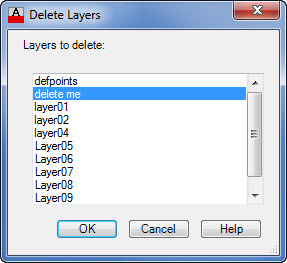 Simply select the layer you wish to have deleted then hit OK. Tip: You can use windows selection methods. Hold down the CTRL key to add more layers or the SHIFT+CTRL key to add a selection of layers (select one, hold down shift, then select another on the list). Remember! If you have objects on that layer they will be removed along with the layer. It is always good practice to run the Layer walk command prior to deleting any layers. You can find the layer walk command on the ribbon in the layer panel. « Where are my Tool Palettes?